Michael Todd (21) was baptised and raised in the Anglican Church and for a number of years he was a regular parishioner at All Saints’ Anglican Church in North Epping. However, interaction with fellow Christian students at the University of Sydney, several of whom were members of various older Christian traditions, deepened Michael’s already strong interest in Church history and inspired him to do further research. 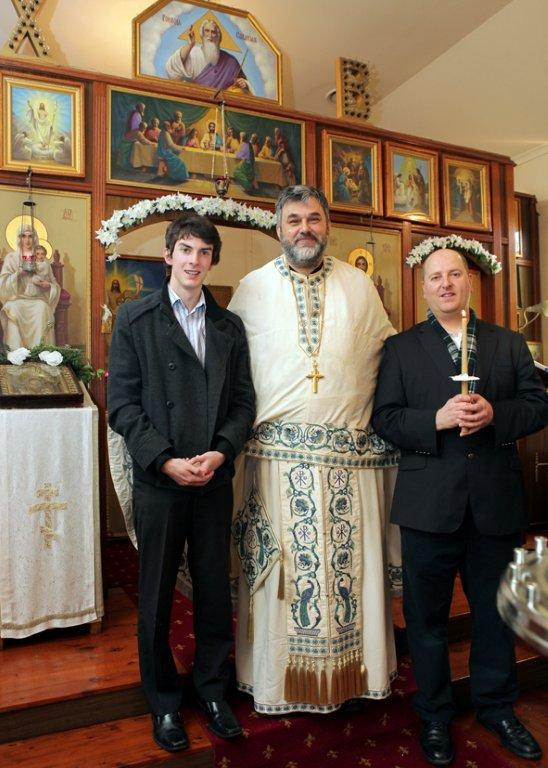 Michael became intrigued by the history and traditions of Eastern Orthodoxy and so he was very excited to discover the webpage of St Michael’s Orthodox Church, since this Sydney-based parish conducts its worship exclusively in the English language. During the second half of 2012, Michael began attending services at St Michael’s, which is located at 38 Wentworth Road South in Homebush. Over the following months, Michael’s interest in Eastern Orthodoxy intensified. Michael’s regular presence at the Divine Liturgy on Sunday mornings fostered a profound attachment to the ancient liturgical worship preserved within the Orthodox Christian tradition. Michael was also able to deepen his understanding of Orthodox theology and history through discussions via Facebook with Ian Michie, a parishioner at St Michael’s Homebush who is a former Anglican and a graduate of St Vladimir’s Orthodox Theological Seminary in Crestwood, New York. When Michael decided to seek admission to membership of the Orthodox Church, he asked Ian to act as his sponsor. Michael was received into Orthodoxy by the rite of Chrismation on Sunday June 23rd, 2013. Chrismation, which corresponds to the Western Christian rite of confirmation, involves an anointing with Holy Oil (Chrism). Chrismation symbolises the indwelling of the Holy Spirit, so it was particularly fitting that this ceremony should be celebrated in conjunction with the feast day of Pentecost, at which Christians remember the descent of the Holy Spirit upon the first members of the Christian Church. Michael Todd is one of several former Anglicans who have become members of the Orthodox Church at St Michael’s Homebush, but he is the first to have done so as a direct result of the strategic use of the Internet and social media by this devout and active parish community. Michael hopes that many other Australians will soon discover and embrace the wonderful gift of Orthodox Christianity that has been brought to this country from its traditional heartlands in Europe and the Middle East. 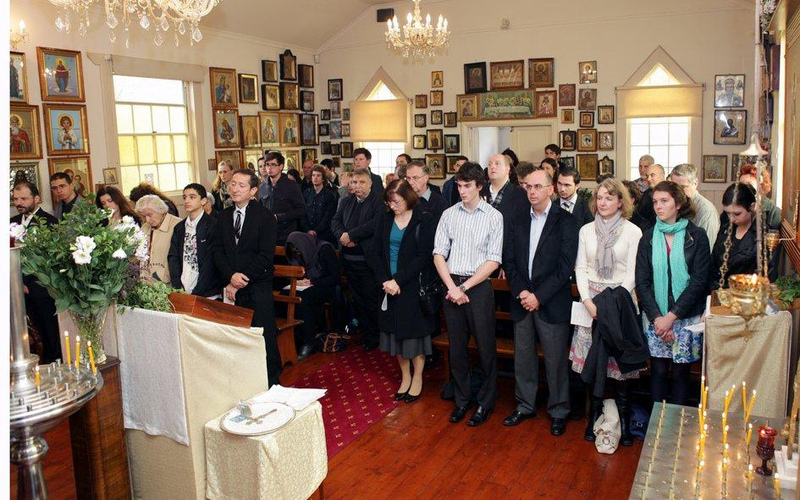 St Michael’s Homebush is an inclusive, multi-ethnic Orthodox parish under the jurisdiction of the Serbian Orthodox Metropolitanate of Australia and New Zealand. All services, music, sermons and church school classes are conducted in English. The parish and its activities are overseen by (Father) John Vesic and his wife (Popadija) Helen Vesic, both of whom are graduates from St Vladimir’s Orthodox Theological Seminary in Crestwood, New York.